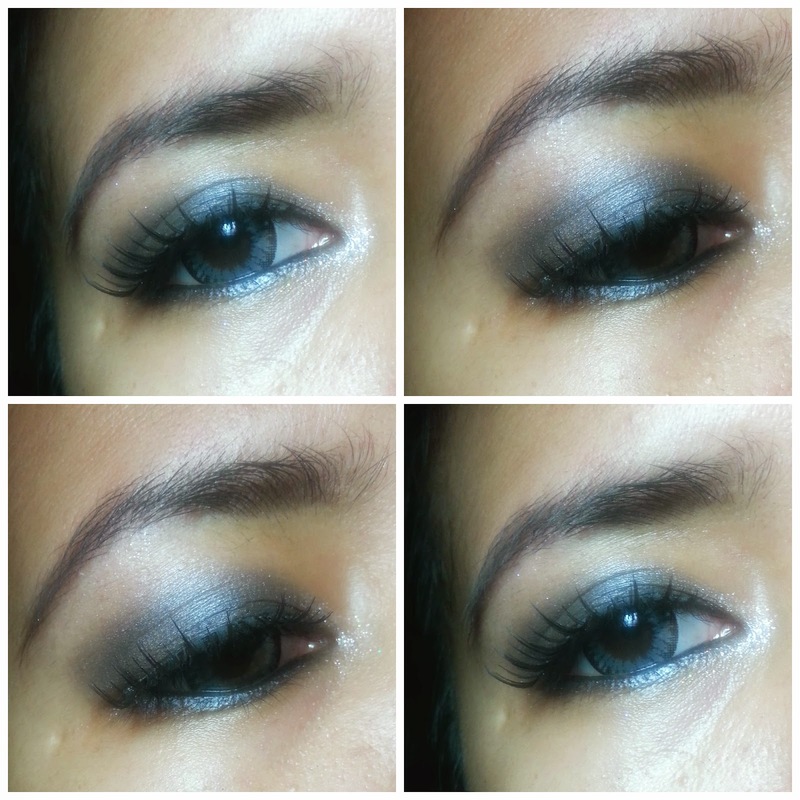 I am back with another review from eyes product. 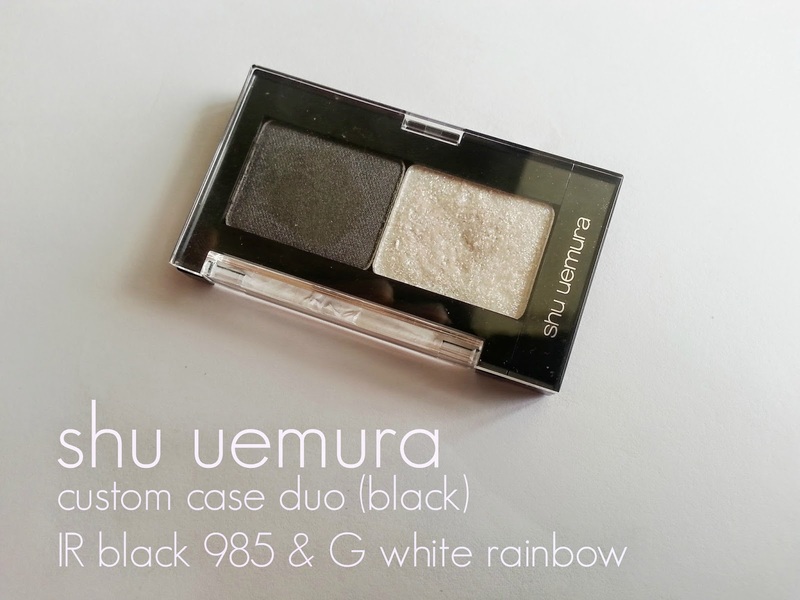 This time I am going talk about the one and only Shu Uemura Eyeshadow. 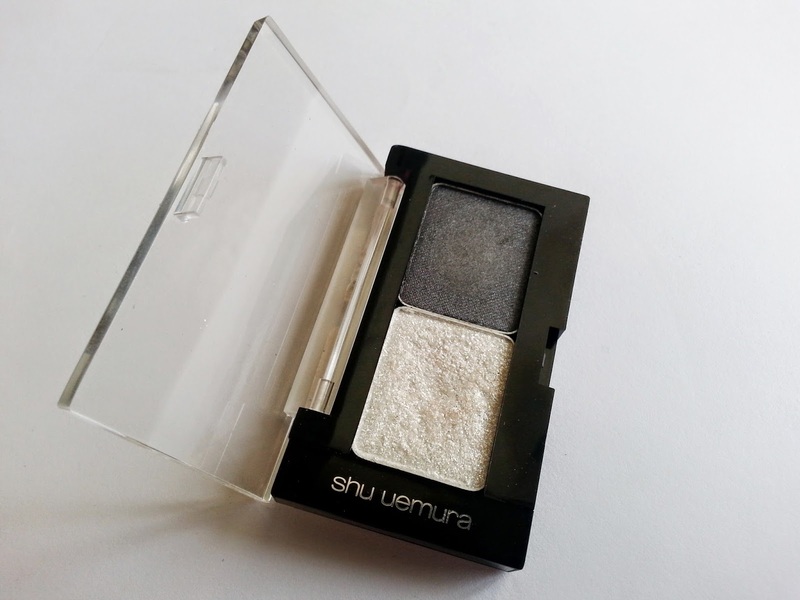 I bought my first Shu Uemura eyeshadow around a year ago and it was this pearly gorgeous eyeshadow, G White Rainbow. I decided to buy it after I saw my dance teacher using it, and I thought the color was expectationaly pretty and unique. Anyway, I didn't know that for a single tiny refill pressed eyeshadow (without a container) the price was so expensive , I remember it was around IDR 140.000. 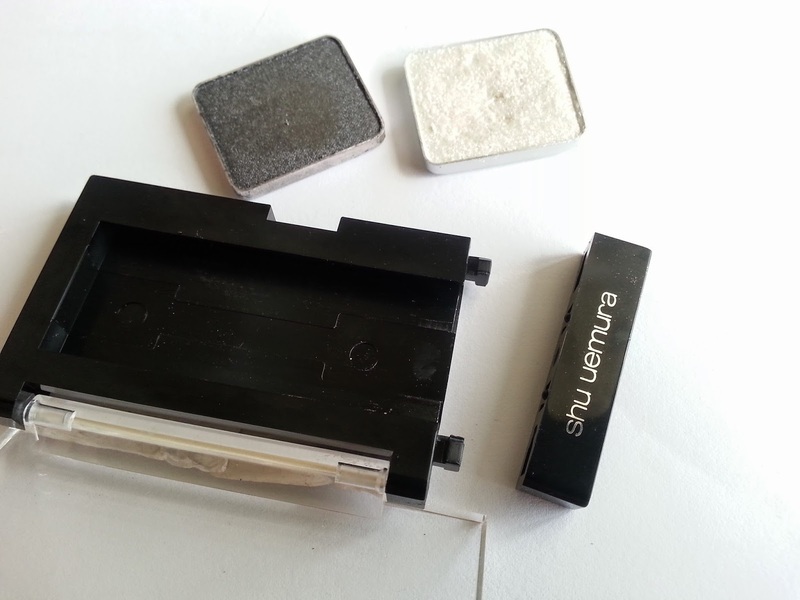 So after that purchase, I avoided to buy other product form Shu Uemura for a while until finally I felt my Shu Uemura pressed eyeshadow needed a container. So I ordered right away when I saw an online shop held a discount for Shu Uemura products. And not only I ordered a container which is enough for 2 pressed eyeshadow, but I also ordered another refill eyeshadow to accompany my old SU eyeshadow. And that's the story how I end up with this eyeshadows and the custom case. Lets talk about the eye shadows first. 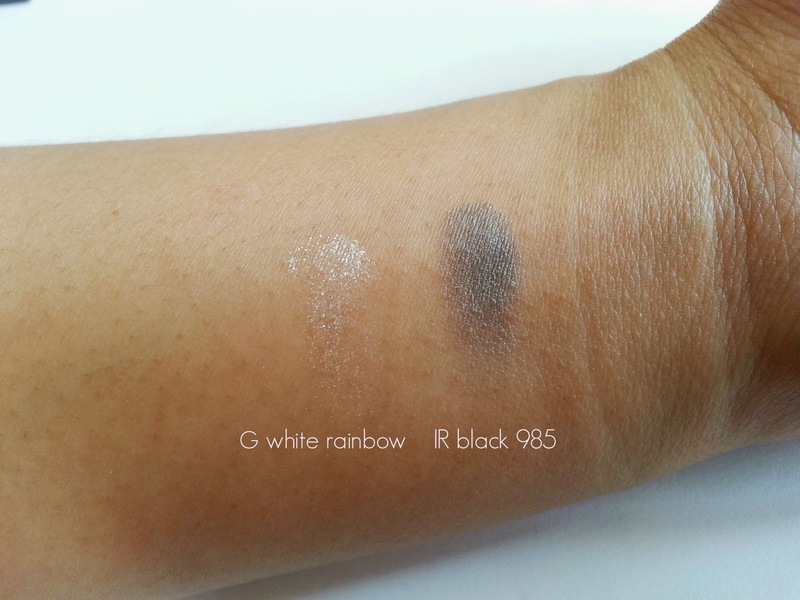 I have 2 shades which are G White Rainbow and IR Black 985. G White Rainbow is a pressed glitter eyeshadow which is one of my favorite eyeshadow ever. The color is so pretty and looks like a rainbow in your eyes. Never seen any eyeshadow that has this shade before. The texture is unique though, because it looks like it has a chunky type of glitter since the glitter so noticeable, but when you swatch it, it's pretty smooth and subtle. Very pleased with this eyeshadow and definitely repurchase it when I finish this one. On the other hand, IR Black 985 has a complete different texture and type of shimmer. It got a regular metallic/shine of a simmer eyeshadow. The texture and color of IR Black 985 reminds me alot of Ace from Urban Decay. It has a good quality and decent pigmentation but nothing special. I mean for the amount of money that I paid, it was worth it to get the G White Rainbow, but not for the IR Black 985. Lets move on to the container of this eyeshadow. On the website, SU has 3 sizes of custom cases and they are all black. It's mono case, quad case, and duo case like the one that I have. The idea of this custom case is so you could fill the case with shades that you want. In my case, I already own the eyeshadow first then I got the container. One thing for sure, this container is expensive. I remember back then, for single/mono case it cost around IDR 80.000 and for duo case the price is IDR 120.000. After I think about it , I prolly better get a Z palette instead which is slightly more pricey but holds more eyeshadows... but oh well. SU duo case is note a magnetic palette. To put the eyeshadow inside you have to gently pull out the end of the case, and once it open you can slide the eyeshadow in and close the lid again. I think this type of case is more secure compare to the magnetic one. So I am pretty happy with it. To sum up this review, I am happy with SU pressed eyeshadow in G White Rainbow and also the duo case. Yes they are pricey but the idea was to get Shu Uemura eyeshadow and Shu Uemura eyeshadow case, which I did, so I am not going to complaint. But I was kinda hoping I pick other shade rather than IR Black 985, not because it's a terrible eyeshadow, but it's just happened I have several eyeshadows that have a similar shades. So let me know how you built you custom case? Is it holds lots of color or only duo shades like mine?